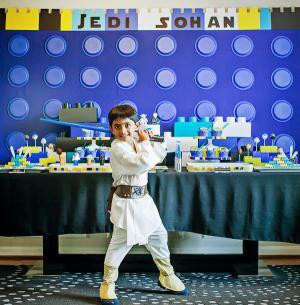 If you, your son, or daughter is a Star Wars fan, then a Star Wars themed party can be an out of this world experience. Pulling this theme together can be as fun as the party itself. Draw inspiration from these galactic ideas for a party out of this galaxy, regardless of whether you're planning for a child or adult. Kids can be less familiar with the old Star Wars movies and more familiar with the newer movies, the Lego version of Star Wars, or the Star Wars: The Clone Wars TV. series. Work in these more contemporary Star Wars references as little or as much as desired. Buy black cardstock. If you buy 8 x 10 sheets, you can create two invitations from one sheet in your printer. Print a Star Wars icon at the top and in white print and use wording that reflects the theme. Based your wording on the movie set up or use a quote from one of the characters, such as Yoda. Eight years ago, in a galaxy not that far away, a boy named NAME was born. The Force is strong with him. You can also use light saber-shaped invitations in neon colors, like the movies, to invite guests to the party. Print the invitation details on this portion of the invite. If you intend on holding a light saber fighting contest, buy individual sabers for each invited child. Attach the party details to the handle of the saber using raffia, twine, or ribbon. Have your child hand deliver the invitations to each child and ask them to bring the saber to the party for a game or activity. 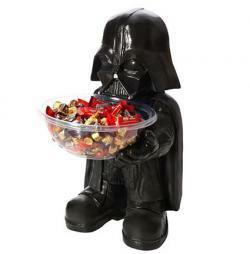 Character bowl holders - Use Star Wars theme bowl holders for a duel purpose. The bowl holders can decorate party tables in the room while holding food, candy, or even party favors the kids can take. Character masks - Line the party area with large character masks that you can print or buy online or at local party stores. You can hang posters from the TV series or other avenue where you are drawing your theme. Personal toys and accessories - Use what you have as part of your décor. Your child might have a t-shirt collection, a lunch box, or even a Star Wars Lego set. Put what you have to use so these are less items you have to buy, but are still able to weave the theme throughout the party. A soccer ball piñata painted black creates the perfect Death Star replica. Guests can be blindfolded and handed a whacking stick to use "the force" to destroy the Death Star. Fill the piñata with small Star Wars toys and characters, along with candy, so the kids can gather up the goods when the piñata breaks open. In the invitation envelope, include a sticky "Hi my name is" name tag with a Star Wars character name for each guest. Ask guests to wear their name tag on their back when they arrive at the party. Have guests interact with each other to guess which character fellow partygoers are by the clues guests give to one another. Have your guests use inflatable light sabers to keep a small inflated ball that has been colored gray from hitting the ground. This is just like the scene where Obi Wan first teaches Luke about the Force in the movie Episode IV: A New Hope. Have your guests create their own planets. 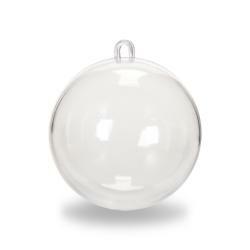 Buy some plastic balls that open into halves (similar to plastic Easter eggs, for example). Provide colored felt, markers, stickers, glue, scissors, and other decorative items the kids can use to let their imaginations run wild in decorating their own imaginary planets. Slide green grapes on to a skewer. Wrap one end with alumni foil to create a light saber handle and serve health light saber treats. Cinnamon buns can easily be Princess Leia buns. Lime green soda or juice can be served as "Yoda Juice." Dessert can be chocolate cupcakes with black colored frosting, topped with themed cupcake toppers. If you're adding a Lego component, surround the cupcake display with chocolate Lego bricks. A Star Wars birthday cake is also a good dessert. Hand out Star Wars molded party rings. The kids can wear them at the party and take them home to enjoy wearing when they play after leaving the party. Temporary tattoos can also be a big hit with children. Oriental Trading Company has a set of 72 temporary tattoos, all with a Star Wars theme, that you can divvy out to the kids at the party or set up a tattoo station where the kids can receive and wear their tattoos proudly during the event. Adults might be looking for a more nostalgic throwback party celebrating their love of the original Star Wars movies. On black card stock with a light saber along the side, print the party details. Consider doing a play on words using various lines from the movie for a fun way to spice up basic invitation wording. Cut cardstock in the shape of a mask or character helmet, such as Darth Vader or Princess Leia buns. Print the party details on to a piece of cardstock that fits on to the shape and glue the party details card to the mask or character helmet. Finish your invitations by wrapping a homemade or purchased invitation with a piece of crepe streamer with the Star Wars theme to look like caution tape. Set up the party to replicate the bar on Tattooine. Keep lights low and loop a long green light rope several times above the bar area. Grab yourself a bartender's guide and start mixing up some fun colored drinks. A little food coloring can make any vodka or gin based drink a colorful exotic space bar refreshment. Serve drinks in a lighted party cup to help create an exotic space port look to your party. Vintage movie posters strategically placed around the room can create the perfect décor for an adult party. Buy huge gold party balloons or silver balloons (to represent stars) and hang them from the ceiling of the party room. 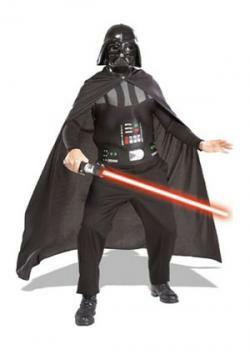 Buy large decals of the Star Wars characters, such as Hans Solo from Home Depot, to stick on the walls of the party room. Pull out the vintage figurines you know have around the house. Use the figurines to decorate the food tables or party guest tables. Hang Star Wars crepe paper from the ceiling or use it to decorate tables. In the invitation, assign your guests a character from the original 1977 movie. Ask them to arrive dressed in costume. Hold a costume contest and hand out awards for the best dressed, best actor, and most creative use of materials to create the costume. Create a series of cards with a quote on one side and the name of the character that said it on the other side. Have your guests split into two teams and see who can name the speaker correctly. Adults who are truly kids-at-heart will enjoy a training course challenge. Have each of the guests run through a backyard obstacle course that you've added decorations from the movies to while they wear their costumes. Record the time it takes them to get through the course. The Jedi with the shortest time wins. Divide guests into groups. Assign them a scene from one of the movies. Allow them a few minutes to plan the scene and then have each group act the scene out in front of the party attendees. You can hand out awards or certificates for the best performance. Serve any food you wish, and like the children's party, apply the theme using the food labels and signs. Put an adult spin on things by serving pitchers of sangria with a label that it is for "Jedi Masters Only" and Darth Roast Coffee. Recreate the logo on cups that you serve the coffee or with a sign or label on the table where you set the coffee out for consumption. 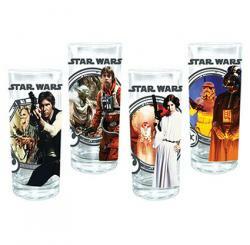 Hand out Star Wars glasses as party favors to your guests. Roll up vintage movie posters and send them home with your party guests. True fans are likely to hang their posters in their home or office, or add to their own collection. Buy bookmarks from a local craft or party store. Use rubber stamps, stickers, or your home printer to add a Star Wars theme to it. Add silky craft ribbon to the hole of the hole of the bookmark and hand them out to guests as they leave the party. Star Wars fans can really get into a birthday party with the galactic theme. Allow your imagination to run wild as you assemble your invitations, party decorations, food, and more, so you can weave the theme throughout the party.